Last year I started regular transparency reports to share some stats on my blog in case anyone is interested. Even though I don’t generate any income from the blog, I think it is worth sharing how the blog is going and what types of posts are of most interest. When I started blogging I had little idea how my blog compared to others and even now I don’t really know. While blogging isn’t all about how many views are received, it is still important. I have a free WordPress blog (with the “no ads” upgrade) which works well for me, so the following are based on the stats available through WordPress. As you can see, I don’t receive all that many likes, comments or shares (in fact likes and shares were less this year than last year). Most people come to the blog via search engines (around 90%) rather than because they follow it. As the graph at the top of the post shows, the number of views is growing steadily – I presume because I have been blogging regularly since February 2011. As the number of posts grows (there are now 684) and as I move towards the top of search engines for some terms, the views slowly increase. December/January and June/July are much quieter months which suggests to me that quite a lot of students use the blog. According to WordPress, in 2017 visitors came from 202 “countries” (Australia 30%; USA 26%; UK 9%; Canada 6%; South Africa 5%). 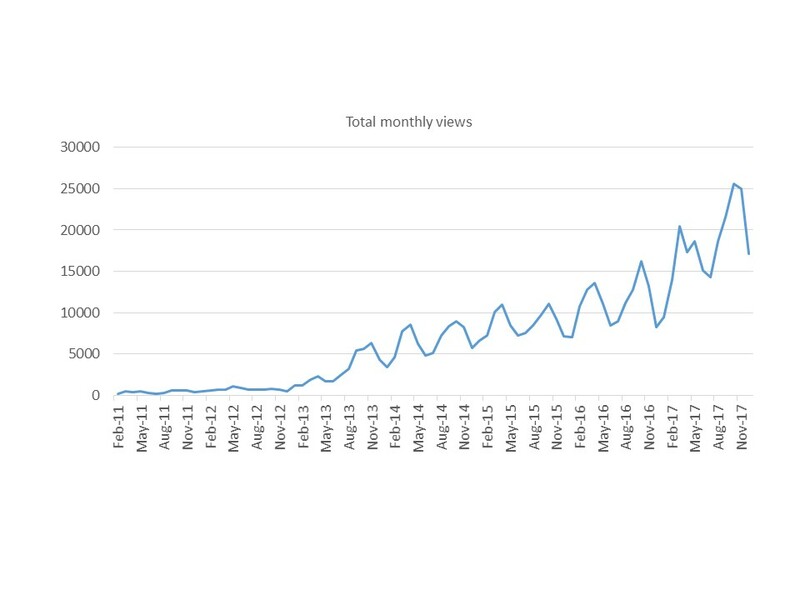 I write for a range of reasons so some of my posts don’t receive many views (e.g., this year 11 of the new posts had 50 views or less) but each year there are a few posts that receive quite a few views. In a separate post I’ll post a complete list of the posts with the number of views they recieved. I’m really happy to share any information about the blog, so if you have any questions, don’t hesitate to ask. This entry was posted in Being an academic and tagged Blog, Blogging, Transparency report. Bookmark the permalink. Cannot make contact for some reason? Peter Durrant. humberstone@pop3.poptel.org.uk 01223 919448. I just find your feedback and information so encouraging and affirming. I have a clear direction where I am going in relation to my studies and my role in community. Training is an area of interest for me and a small group of people and we will be Looking at that soon. We will be using a lot of the information you have give on your site.